Homemade creme fraiche is easy peasy to make in your own kitchen! 1 cup heavy cream, preferably raw, but definitely NOT ultra pasteurized. 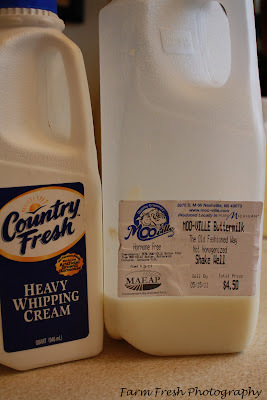 I refuse to skim the top off the raw milk I get, so I use the Country Fresh brand pictured here. 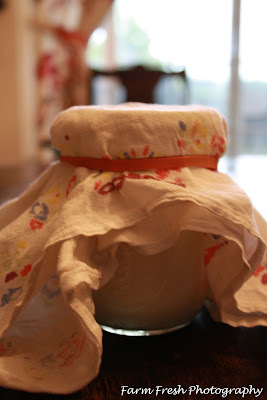 2 TBL of buttermilk...I used a non homogenized buttermilk, but any buttermilk should work. Using VERY clean utensils, mix the heavy cream with the buttermilk, whisking till blended. Pour the mixture in a pint jar and cover with a clean cloth and secure with a rubber band. Let set in a warm spot for 24 hours. 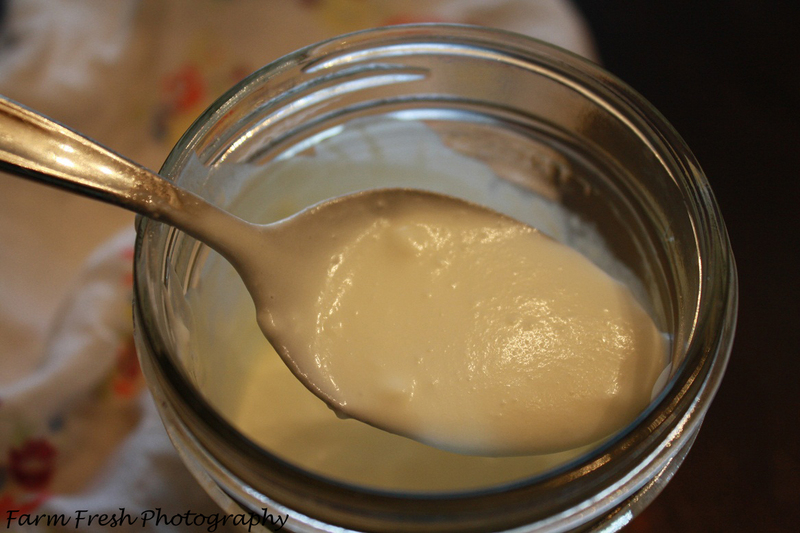 After 24 hours your creme fraiche will be the consistency of a thin pudding. After a few hours in the fridge, LOOK what you have! 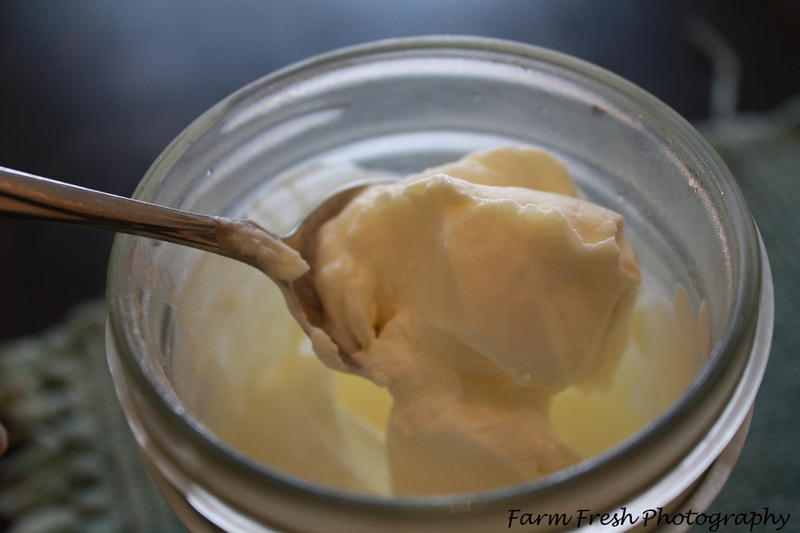 Creme fraiche is similar to sour cream only, uh...BETTER! 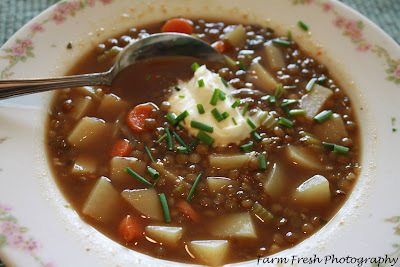 Here I put just a tablespoon in some soup I threw together this morning for a quick lunch. It would also be sublime on a bowl of fresh strawberries, or any kind of berries! Or how about a dollop over a decadent flourless chocolate cake? This should keep about 2 weeks in the fridge, if you don't keep going back for just another tiny taste. Sounds good but where's the post and recipe? :-)!! Ha! Hit the post button before i was finished...all is good now! This looks good. Could I use Kefir instead of the buttermilk with the heavy cream and can this be used on baked potatoes? Can't wait until my arm is back to normal and can get back to my kitchen!!!! Not sure about the kefir, Cheryl, tho I did read where you could use plain yogurt. Heather...I am sure the ultra pasteurized will not work. We just get the best heavy cream we can find that is not ultra pasteurized. I have been wanting to know how to make creme fraiche to serve at tea time. I will be trying this. New to your blog...just love it! Thanks so much!